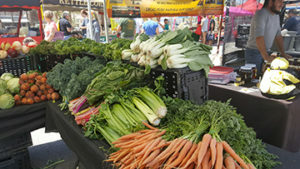 Enjoy our 29 Palms Farmers Market every Saturday, 8 a.m. to 1 p.m. Shop for local and regional fresh produce, seasonal vegetables and fruits, farm-fresh eggs, pure raw honey, fresh-squeezed orange juice, nuts and dried fruit, locally baked bread, herbs, salsa and hummus, plus food and juice vendors, culinary specialty booths, art and craft booths, live music and more! Located at 73484 29 Palms Hwy at Desert Queen Avenue, downtown 29 Palms, next to 29 Palms Visitor Center and Chamber of Commerce, in the parking lot behind Bucklin Park, across from AM/PM and gas station. Info: Chamber 760-367-3445. Wonderful hiking trails can be found in Joshua Tree National Park, and many are accessed directly from 29 Palms. One such wonder is the 49 Palms Oasis. 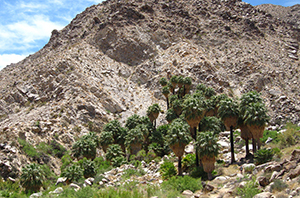 Located on the northern border of the park, 49 Palms Oasis can be reached via a 1.5 mile (2.4 km) trail. To get there from the west end of 29 Palms, turn south off 29 Palms Hwy (Hwy 62) on Canyon Road and drive a short distance to the trailhead. Indian Cove features a campground, picnic area, amphitheater, self-guided nature trail, and rock climbing areas and is the source of the Boy Scout Trail into the park. Located on the west end of 29 Palms, turn south off the highway on Indian Cove Road and drive to the ranger station, where parking is available. The Boy Scout Trail starts a short distance away. To access the Indian Cove campground, amphitheater, picnic and climbing areas, continue on the road.